The burgeoning industry of automotive and telecom have stimulated considerable demand for graphene, citing its unique properties that graphene comes with. Graphene has been developed in 2004 and is widely known for being excellent conductor or both electricity and heat, strong, and light in weight. The soaring usage of Graphene in many of the end-user industries is very likely to propel the said market in the years to come. Though graphene was discovered just about 10 years ago, its utilization has been quite phenomenal. Quite known for its characteristics such as being strong and light-weight, graphene is widely regarded as tougher than diamond as well. These properties of Graphene have made it quite popular amongst various electronics companies that are making use of it for the manufacturing of smartphones. The demand for this wonder material is also anticipated to bolster up as defense industries, aerospace, electronics, telecom, and automotive flourish. In a market intelligence report by Transparency Market Research (TMR), it has been anticipated that the growth trajectory of the said market over the period that extends from the year 2017 to the year 2025. Transparency Market Research said that that the opportunity in the world market for graphene was worth around US$ 12.2 mn in the year 2014 and is anticipated to attain a market valuation of around US$ 159.2 mn by the year 2023 thereby rising at a double digit growth rate of 33.5% CAGR between the years 2015 and 2023. 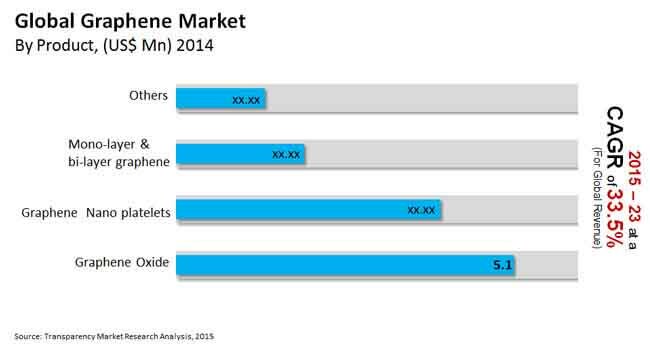 The segment of electronics is the leading end-user segment of the world market for graphene. In the year 2014, this segment accounted for a leading share of around 32.5% in the overall market for graphene, which is anticipated to reach a market share of around 34.7% by the end of the year 2023. As electronic companies are making investment in reaping potential benefits graphene in the years to come, this end-user segment provides graphene market several opportunities to grow. For example, numerous phone making companies are making use of graphene so as to manufacture memory chips as this Graphene expands the capacity of the storage of the phones. Graphene is also being utilized so as to make touchscreens, and the material is exceptionally flexible and light, thus leading to an excellent alternative for silicon. North America is one of the crucial regions in the world market for graphene. As of the year 2014, the region of North America accounted for around 40.2% of the market share in the said market. By the end of the year 2023, this market share is estimated to reach around 42.1%. The key product segment in the region of North America is graphene oxide which is trailed by graphene nanoplatelets. The defense and aerospace segment is also anticipated to make a substantial contribution in the years to come. The manufacturing expertise of this region together with the availability of raw materials is estimated to boost the world market for graphene in North America. The region is estimated to be trailed by Europe as the region is making significant investments so as to develop the wonder material. The prominent market players comprise names such as Grafoid Inc., Nano Material Tech, Advanced Graphene Products, Graphenea S.A., Graphene Frontiers, Applied Graphene Materials plc, Nanjing XFNANO Materials Tech Co., Ltd, Haydale Ltd., Applied Nanotech Inc., and ACS Material LLC.